You guessed correctly (I assume)! It’s a lightsaber. 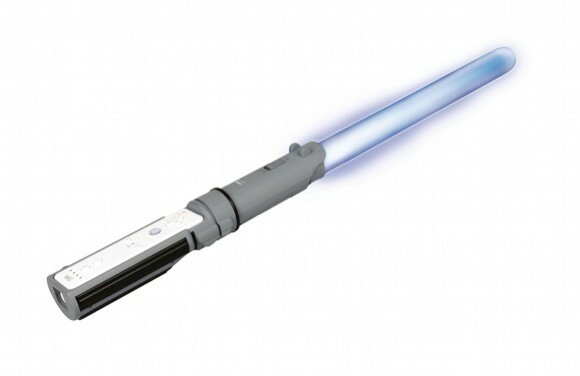 Well, let’s be honest: it’s a glowing rod that projects from the end of your Wiimote and makes lightsaber noises. And, geniuses that they are, the makers decided to make sure this thing didn’t support the MotionPlus add-on. Sure, the game they’re going to bundle it with (Republic Heroes) doesn’t support it either, but come on, just make the bottom end extend a little more. As for the blaster, another official Star Wars accessory being put out for the same game, I can’t say it looks very much like a Star Wars-type object. I guess the newer movies featured more gleaming white objects like this, but I much prefer the blaster you had in Dark Forces and Jedi Knight. Those were, of course, not actual real objects with real-life limitations, but still. The game and attachments will be available September 15. Begun, the accessory wars have.